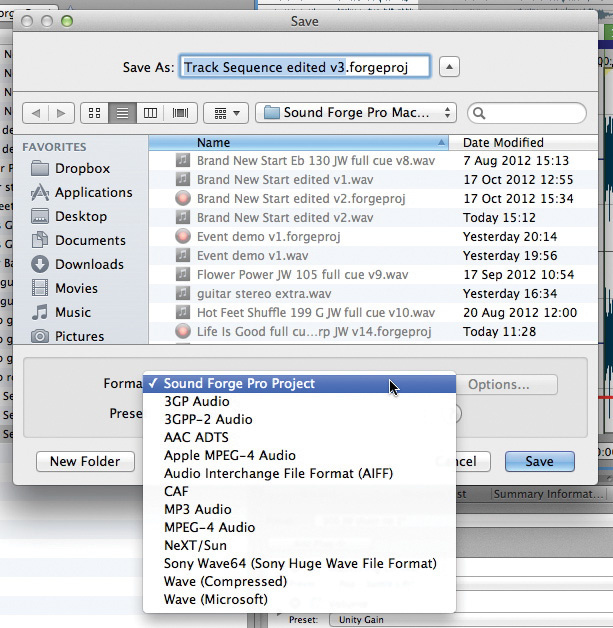 The Sound Forge Pro Mac interface is easy to use and fully customisable. In recent years, the Windows platform has been much better supplied for audio editing software than the Mac, thanks to applications such as Steinberg's Wavelab, Adobe's Audition and Sony's Sound Forge. Mac users, by contrast, recently lost one of the few well-specified Mac-only audio editing packages when BIAS went out of business but, fortunately, Sony have now followed Steinberg in porting their flagship program to the platform. To the surprise of many, given their very long-standing PC-only product line, Sound Forge Pro Mac is with us now. While it bears some visual similarities to Sound Forge on the PC, Sony are at pains to point out that this is not a port: Sound Forge Pro Mac 1.0 has been built from scratch for OS X. Although this means that the transition between the PC and Mac versions is not a totally transparent experience for users, it does mean that SFPM looks very clean and fresh. SFPM supports record tasks of up to 32 channels.Hardware permitting, SFPM supports a wide variety of audio formats, and can record up to 32 simultaneous channels at 64-bit/192kHz resolution. You could, therefore, use SFPM to record or edit anything from the simplest mono sample up to a high-fidelity, multi-channel live recording, and presets for recording common surround channel configurations are included. All the usual editing tools — trimming, cutting, pasting, adding fades, and so on — are present and correct. A sensible selection of processing tools is, likewise, available, as is a range of third-party plug-ins from iZotope and Zplane, and any other VST or AU plug-ins on your system are also available within SFPM. As well as applying processors individually to a file, or a selection from a file, users can also build plug-in chains and save them as presets, while effect controls can be automated via envelopes. Once your editing is done, your beautifully crafted audio can then be rendered in a range of audio formats including MP3, WAV and AIF. All of this sounds great, but I should point out now that, compared with the Windows version, there are also some surprising omissions in this first SFPM release. I'll return to this point later. The upper toolbar strip aside, the main SFPM display is divided into four user-configurable, areas. 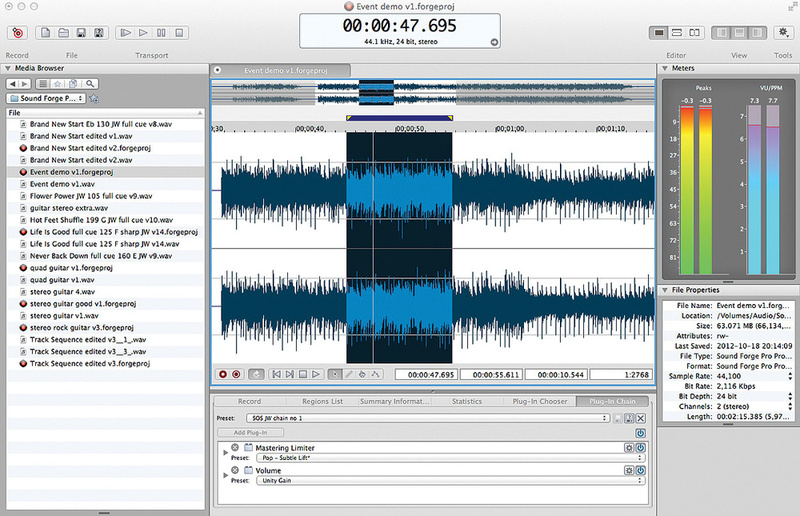 The Editor pane dominates, displaying a waveform overview area which shows the full length of the audio file and the main waveform display, where detailed editing is carried out. Within the waveform overview, the mouse can be used to highlight a portion of the file, which is then shown in more detail in the main waveform area. Using the mouse to change the size or position of the highlighted portion in the overview is very intuitive, making it easy to move the selection or to control the degree of zoom in the main waveform display. Within the main display, the mouse can be used to make selections for editing tasks. Depending upon where you drag — along a track's edges, in the centre or across tracks — you can select material from just a single track or all tracks; again, it's all neat and very intuitive. If you want multiple files open at the same time, tabs appear at the top of the Editor pane, and you can also open a second Editor pane and stack the two panes, either vertically or horizontally. Three further panels can be made to appear to the left, right and underneath the Editor pane. A range of tools can be displayed in these locations, including the Media Browser, Meters, File Properties, Regions List and the Plug-in Chain. In the left and right panels, the tools are stacked, while in the bottom panel the tools appear as a tabbed list and the user can switch between them. If you just need more room for the Editor pane, you can, of course, just toggle the display of these additional panels off. All in all, I like the overall design of the user interface and I think this is one area where Sony's 'fresh start' approach to developing the Mac version has paid off. Projects can be saved in a variety of audio formats as well as the SF project format. 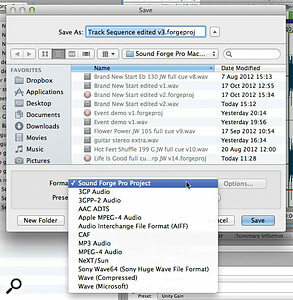 Sound Forge Pro Mac's suite of tools caters for all general editing tasks with ease. You can work directly with a range of audio file formats but, if you are going to do any serious work, it is well worth saving the file as a Sound Forge project (this has a '.forgeproj' extension). 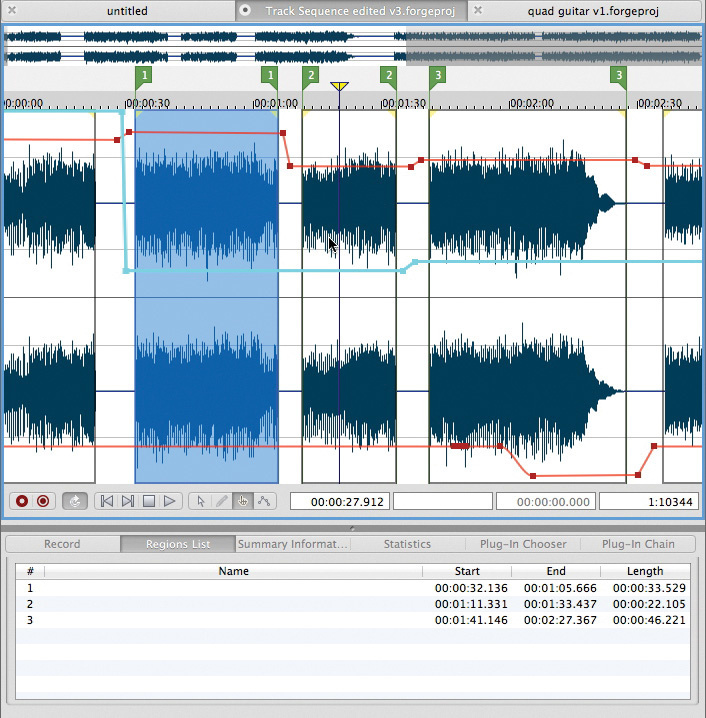 This format contains your audio plus other elements you might have added via the editing process, such as markers, regions, plug-ins and plug-in automation, and an edit history. The last is particularly useful, as it allows you to undo your edits should you wish, although it would be even better if there was a 'history list' that could be viewed and from which you could pick a point within the history to return to; as it stands, you just have to step backwards one edit at a time. By contrast, edits made to a WAV file are applied destructively when the file is re-saved. Editing work is done in four different modes, which can be chosen via the buttons at the base of the Editor pane or from the Edit menu. The default mode is Time, wherein the cursor appears as a standard arrow which can be used, for example, to make time-based selections within the Editor pane. Pencil mode lets you redraw the waveform manually, and is available only at high magnification levels, while Envelope mode is used when creating and editing automation envelopes. The other mode is Event, of which more in a moment. SFPM includes a fairly standard marker system, so that you can highlight specific points along the timeline. New markers can be added at the current cursor position using the 'M' keyboard shortcut. You can make a time selection within your waveform by clicking and dragging in the area between the overview waveform and the time. Having made such a selection, if you right-click on the horizontal grey bar that defines its length, a context menu appears, allowing you to loop playback of the selection or to insert a Region. Regions (indicated by the green flags) and Events (the vertical boxes) provide various ways to organise sections within your audio, while an envelope system allow effects parameters to be fully automated.Once defined, Regions then appear in the Region List pane (markers also appear in this list), where they can be named. As well as identifying key sections within your project, such as verses and choruses, SFPM's Regions can be exported as separate audio files. This has a number of potential uses: for example, if you wanted to define a number of short loops from within a single recording, each could be identified as a Region and then be exported in a single operation. When in Event editing mode, you can split the current file at the cursor into separate Events. Events can have their own fade-in, fade-out and level curves, and two Events can be crossfaded. Like Regions, they can be resized, but they can also be moved along the timeline. 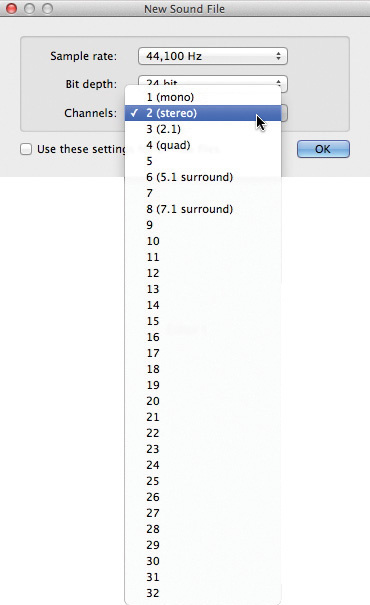 This makes it possible to rearrange audio. For example, you could swap the first and second verses of a song around, or retrospectively change the set list of a live concert recording. Equally, if you were to cut and paste a series of individual song mixes into a single SFPM project and define each as an Event, you could experiment with a CD running order. Indeed, one of the timeline options is to display Audio CD Time, so you can also check whether your total running time will fit on a CD. Rather oddly, you cannot currently export Events as separate audio files, as you can with Regions. This is not such a big deal, as you can create a Region from an Event, although you have to do this one Event at a time. A 'convert all Events to Regions' command would be nice. The bundled iZotope plug-in offers excellent mastering, corrective and file conversion tools.Sound Forge on the Windows platform includes a number of Sony's own audio processing plug-ins, which had always been something of a weakness. The Mac version includes a small number of Sony's own plug-ins for processes such as normalisation and channel conversion, but mainly takes advantage of Apple's stock plug-ins, which both look better and, to my ears at least, sound better than their PC counterparts. AUDistortion, AUDynamicsProcessor and AUMatrixReverb are good examples, all offering plenty of control in an easy-to-use format. 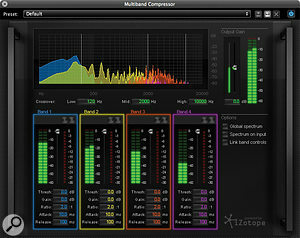 Even better are the various iZotope plug-ins. 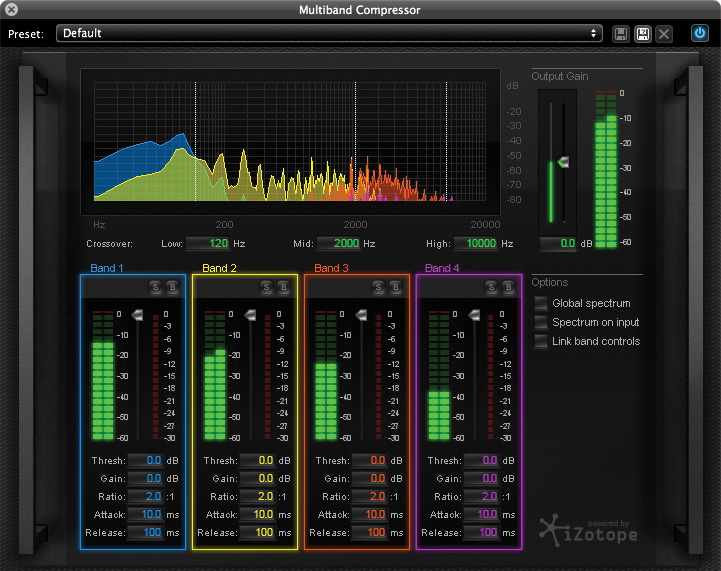 I've always been a big fan of iZotope's Ozone mastering software and here, with the separate EQ, reverb, compressor, limiter, stereo imager and exciter plug-ins, you get a very similar range of functionality. As is the case with the PC version, you also get the very effective iZotope declicker, denoiser and declipper, plus their sample-rate and bit-depth conversion tools. This adds up to a lot of processing possibilities. 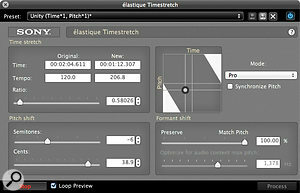 Pitch-shifting and time-stretching are also catered for, both with Sony's own offerings (which are decent) and with the Zplane Elastique Timestretch plug-in. Although this is an offline processor, you can preview the results before applying them, and the quality is very good. 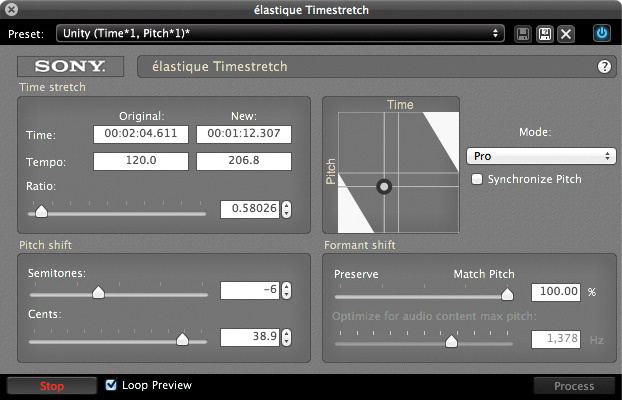 Zplane's elastique Timestretch plug-in facilitates high-quality pitch and tempo adjustment.Plug-ins can be applied individually via the Plug-in Chooser pane or — and with much more flexibility — using the Plug-in Chain pane. The latter is well designed, and allows you to apply multiple processors, adjust the order in which they are applied, bypass individual plug-ins or the whole chain, and save the entire chain configuration as a preset for use with another project. The Plug-in Chain also provides access to SFPM's automation system. 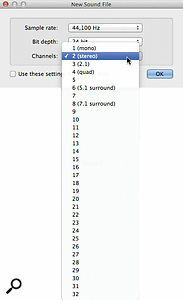 Clicking on the arrow icon beside a plug-in's name displays a list of individual controls, each of which can be automated. Clicking on a parameter's power icon followed by the envelope icon adds a coloured envelope to the waveform display for that parameter. Different colours are used for each parameter, and hovering the mouse over a particular curve generates a pop-up label, so it is easy to identify which curve is associated with which parameter. Nodes can be added to the curve by clicking and adjusted by clicking and dragging. This is all pretty standard stuff, but works smoothly and is easy to use. The Plug-in Chain pane provides a flexible and powerful system for configuring your effects processing.In short, I think Sony have done a decent job in terms of the processing options provided with SFPM. While many users may well have a host system already stuffed with their favourite plug-ins, if you're starting from scratch, SFPM has all the core processing tools you might need to get the majority of typical audio editing tasks done. So far, so good: Sound Forge Pro Mac has a fresh, efficient workspace, decent editing tools and a very respectable collection of plug-ins. However, as mentioned earlier, compared to the current PC version, there are also some surprising omissions. For example, SFPM doesn't include support for working with video. Yes, you can work with audio formats suitable for all varieties of broadcast video, but there is no video window and no import/export of video file formats. In addition, although the metering options in SFPM are decent and you can change the metering style between a number of useful presets, this first Mac release lacks the spectrum analysis tools available in the PC version. However, perhaps the two most significant omissions — from my own perspective at least — are the lack of batch processing and audio CD burning features. If you do lots of repetitive editing tasks on multiple files, batch processing is essential, and I imagine that its non-inclusion will be a deal-breaker for some potential users. The ability to burn a CD from the Sound Forge timeline is something that only came to the Windows version in recent years, but even so, it's now something that PC users take for granted. Its omission is all the more surprising, as the core elements required to arrange multiple songs along the timeline of a single SFPM project are in place. With a combination of the Event and Region functions, you can display the timeline in an Audio CD Time format and fully automate parameters for your suite of mastering effects in the Plug-in Chain on a song-by-song basis. What you can't do is then burn the result to an audio CD — and nor is there the capability to export the whole project in something like a Disc Description Protocol (DDP) format that a CD mastering house might use. Instead, you have to export the Regions as individual audio files with the effects applied and then reassemble the songs in another application, such as iTunes, to burn the CD: a solution, but not a very elegant one. I'm not, of course, the only person to make these observations and even a quick look through the Sony forums reveals that the company are well aware of these omissions. Comments there are encouraging and suggest that future updates will bring more features. Time will tell but, until then, potential purchasers need to be aware that the full feature set of Sound Forge Pro 10 on the PC has not made it across to this first Mac release. Sound Forge Pro Mac 1.0 is, then, a bit of an enigma. It has a very slick user interface, which I found a pleasure to use and very easy to learn. It is supplied with a good selection of editing tools and audio processing options. However, compared to the Windows version, and also to the obvious professional-level competition, it is missing some significant features. As a general audio editor for someone working on individual audio files, SFPM is a pleasure to use. If, however, you regularly script repeated edits to multiple files or want integrated CD burning, SFPM is not, currently, the tool to choose. Sony are aware of this and one can hope that this will be corrected soon — and, in fairness, this first release of SFPM is significantly cheaper than the PC version or Steinberg's Wavelab. My own take is that this is a promising start and that Sony will quickly take the Mac version forward. I'll conclude by offering one final — and more general — thought. Until now, Sony's creative media software has been Windows-only. I've used all three of their flagship products (Sound Forge, Vegas and Acid) extensively on the PC over many years. Having shifted my own studio system to the Mac platform relatively recently (although I still have PCs in place), the announcement of Sound Forge for the Mac was something I found very welcome. While this first release has some cons as well as some pros, I'm intrigued to know whether Sony's other media applications are also going to make the transition. I'd very much like it if they did appear on the Mac but, equally, if this were to happen, I'd be happy to wait a little bit longer if that ensured fully featured versions straight out of the box. The obvious alternatives on the Mac platform include Steinberg's Wavelab, plus a number of freeware and shareware applications such as Audacity and Rogue Amoeba's Fission. The recording process in Sound Forge Pro Mac is impressively efficient, whether you are recording a simple mono source or a 32-track monster. You can configure the routing between your various hardware audio inputs and Sound Forge's channels via the main Preferences dialogue, and unless you swap between a number of different audio hardware configurations, this is a 'set and forget' task. Then, when selecting a new recording from the File menu, you simply have to choose the required audio format (number of channels, sample rate and bit depth). As well as recording to a new file, you can add new audio to the end of an existing recording, or drop in to replace an existing section of a recording. A cycle recording mode is also available, where you can loop between a start and end point and the existing audio is replaced by the the most recent pass. The PDF manual refers to this looped mode as recording 'takes'. I suppose they are, but this is not the same as making multiple takes in a DAW such as Cubase or Logic: only the most recent 'take' is preserved as part of the recording. The Record pane also includes a Monitor Inputs tick-box to switch on software monitoring if you need it. I did experience the occasional audio glitch when using this feature, but it was intermittent and difficult to reproduce, so I was unable to isolate its exact cause (although my test system does run very smoothly with other audio software I use on a daily basis). Sony do provide a fully featured, time-limited trial period, so you can easily test the performance of SFPM on your particular system prior to making a purchase if you have any concerns on this front. In all other respects, my experience with SFPM passed without incident and, while I didn't get the opportunity to really stress-test it with a big, mega-channel, recording task during the review period, my experiments with recording and editing mono, stereo and four-channel recordings were painless. Intuitive in use for general editing tasks. Good collection of audio processing options. Several other features of the Windows version are missing. Sound Forge Pro Mac 1.0 has an excellent user interface and processing options, but is let down in its current release by some significant omissions, including batch processing and CD burning. SCV London +44 (0)208 418 1470. Sony Creative Software +1 800 577 6642. 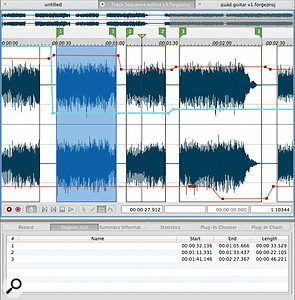 Sound Forge Pro Mac v1.0.20. Apple iMac with 3.4GHz i7 CPU and 16GB RAM, and TC Electronic Konnekt 24D interface, running Mac OS 10.7.5.